Totally in love with this bespoke piece, new to our collection. During the 19th century the age-old desire to encircle the finger with a ring became as strong as ever with decorative rings dominating the jewellery trend at the time. The design and style of decorative rings, initially inspired by Art Nouveau, saw a dramatic shift when daring contrasts of colour, modern cuts of gemstones and geometric designs entered the scene. This piece is inspired by this exact change – the 1930s, when geometric outlines of Art Deco styles were dramatised and an architectural touch was introduced to jewellery design with scale becoming oh so important. 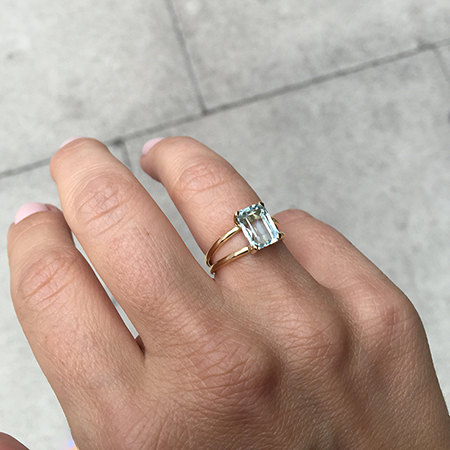 This emerald cut Aquamarine is set in a traditional four prong setting and sits on a modern solid gold double band, looking bold. Just thought I’d get in touch to thank you for the fabulous ‘Aces’ Necklace you made for my daughter – she was absolutely thrilled to bits, as was I! It is beautiful and delicate and just what we wanted.It was perfectly presented in the ribboned box, which was a lovely touch. Thank you once again for your attention to detail and I look forward to doing business with you again.